A deep view of the peculiar galaxy Centaurus A (NGC 5128) was captured by the Wide Field Imager attached to the MPG/ESO 2.2-meter telescope at the La Silla Observatory in Chile. A telescope in Chile has caught a spectacular new view of a peculiar galaxy with a monster black hole at its heart. 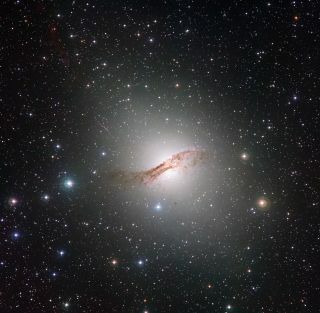 The new image shows the galaxy Centaurus A, which is a sprawling elliptical galaxy located about 12 million light-years from Earth in the southern constellation of Centaurus (The Centaur). The peculiar galaxy emits strong radio emissions and is the most prominent radio galaxy in the sky, according to officials from the European Southern Observatory (ESO). Centaurus A's bright nucleus, powerful radio emissions, and jets may be produced by a supermassive central black hole that is 100 million times more massive than the sun, astronomers have said. As matter falls toward the black hole, the dense, central parts of the galaxy release huge amounts of energy, ESO officials said in a statement. The portrait reveals the elongated shape of the fainter, outer sections of the galaxy. The dreamy glow is created by hundreds of billions of cooler, older stars in the vicinity. But unlike most elliptical galaxies, Centaurus A has a broad patchy band of dark material at its heart that obscures the galactic center. This dark region is full of gas, dust and young stars, ESO officials said. At the upper right and lower left edges of the band, bright, young star clusters can be seen. Star-forming clouds of hydrogen, with their distinct red glow can also be distinguished. These intriguing features, and the strong radio signals from Centaurus A, strongly suggest that the galaxy is the result of a violent galaxy merger. The dusty band is likely the remains of a spiral galaxy that is being ripped apart by the gravitational pull of a massive elliptical galaxy, ESO officials said. Reddish filaments that stretch from the galaxy to the upper left corner of the photo are stellar nurseries that contain hot, newborn stars. The inner filaments above the left side of Centaurus A's dusty band, are about 30,000 light-years from the galaxy's nucleus. In the upper left corner of the image, the outer filaments are visible, which are even more distant, at approximately 65,000 light-years from the galaxy's center. Using long exposures and special filters that isolate light from glowing hydrogen and oxygen, researchers can spot special features, such as Centaurus A's optical jet features. In fact, astronomers think a very faint trace of a counter jet reaching to the lower right of the image may have also been captured in this view. Centaurus A is a popular subject for astronomers, and the elliptical galaxy has been studied at a variety of wavelengths, ranging from radio to gamma rays. X-ray and radio observations have helped researchers study how the energy released from the central supermassive black hole interacts with its surroundings.